Devil Survivor 2 pre-orders delayed | Blog | Ghostlight Ltd.
Hi everyone. I’m starting this week’s blog with an apology. As some of you have already noticed, we’re sorry to say that pre-orders for Devil Survivor 2 haven’t gone live this week as previously planned. Don’t despair though, as we’re just waiting on final approval of the content that we hope to include with the European edition. We could open pre-orders now, but we don’t think that would be fair without being able to tell you conclusively what you will be receiving. This factory sealed edition will be available to all PAL territories and anyone pre-ordering from us will have the option to include their name in the DS2 manual. Devil Survivor 2 (DS) & Devil Survivor Overclocked (3DS) with £10.00 discount! Both games will be factory sealed and as with Option 1, anyone pre-ordering the bundle will have the option to include their name in the DS2 manual. Regrettably, we will not be able to ship this bundle to Germany due to an existing distribution agreement. We know that asking for pre-orders with no guarantee of release is expecting a huge amount of trust from you. So in an effort to be as open with you as we can, we are going to share a few figures with you. To break even on Devil Survivor 2’s manufacturing costs, we will need to reach a total of 1800 pre-orders between the two options offered and pre-orders will be open for one month only. If we don’t meet (or come close) to this quota during that time, then everyone who ordered Devil Survivor 2 on its own will receive a full refund while those who ordered the bundle will receive a refund of £24.99 - meaning that you will still receive Devil Survivor Overclocked with the huge £10.00 discount. We’re expecting manufacture to take five weeks so assuming we reach our target and we enter manufacturing when pre-orders close, the game should be released at the end of September. If we reach our target sooner than the pre-order deadline, then we will naturally move into manufacturing before the close of pre-orders, meaning that you would get your game a little sooner. In any event, I will keep you all updated on a regular basis to let you know how things are going. 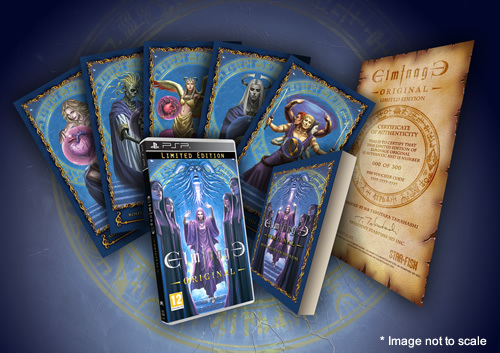 In other equally important news, Elminage Original LIMITED EDITION is coming along nicely and we are expecting to be able to give a release date and open pre-orders in the next couple of weeks. I know quite a few of you are looking forward to this very special and extremely limited edition so to whet your appetites I thought I’d show you this image detailing the goodies we’re going to include. Remember that only 300 of these beauties will be made so be sure to keep an eye on the blog as we’ll be announcing when pre-orders go live on here. That’s all for now, but before I go I just wanted to offer our continued thanks to all our Agarest PC Beta testers out there – you’re all doing a fantastic job! I’ll be back next week, but until then why not follow us on our Twitter and Facebook pages, our Youtube Channel and our Google + account, where we’ll be posting all the latest news from Ghostlight? You can also follow me on Twitter for a more personal take on all things Ghostlight.